Stylists at the St. John Knits boutique in King of Prussia are at your service to help you discover the St. John wardrobe that fits every part of your lifestyle. The King of Prussia boutique wardrobe specialists can dress you in the right pieces through a completely personal and luxury shopping experience St. John is known for. We also offer a suite of additional client services including alterations and style consultation. Please inquire for more information with the boutique at (484)-751-0772. Placed conveniently near 6 different highways and the Pennsylvania Turnpike, the King of Prussia Mall is an unmissable destination for St. John King of Prussia clients who range from your casual elite shopper to business professionals. As the newest St. John Boutique, the King of Prussia store offers a welcoming and modern space where clients can shop the latest collections alongside the help of our experienced Wardrobe Specialists. Browse all of the season’s must-haves including jackets, dresses, gowns, skirts and more at the boutique located on 160 North Gulph Road. You can always expect the unmatched level of personal service and attention to detail that we’re known for when you visit any day of the week. We practice craft and couture. With iconic American design and signature knits, we invite you to experience first-hand, the meticulous details, craftsmanship, and one of a kind embellishments that have become synonymous with St. John Knits. 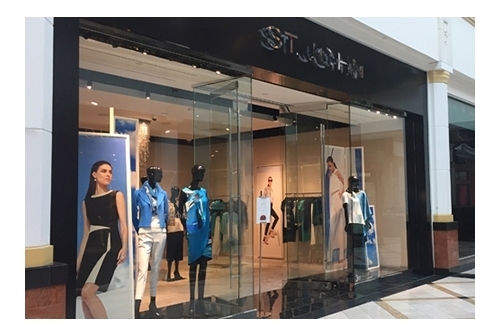 Visit us at the St. John Knits King of Prussia boutique and we will personally guide you through the range of St. John collections to see the effortless, alluring and refined clothing that has appealed to women all over the world since 1962.